I always finish what I start, says the LORD, and I want you to be like Me. Finish the good work that you have begun. I have no unfinished business. I have NO incompletes. I do not abandon My WORK and MY WORD and MY WILL! They are in alignment and agreement always. I desire you complete the assignments that I have given you as I have fully equipped and enabled you to do. 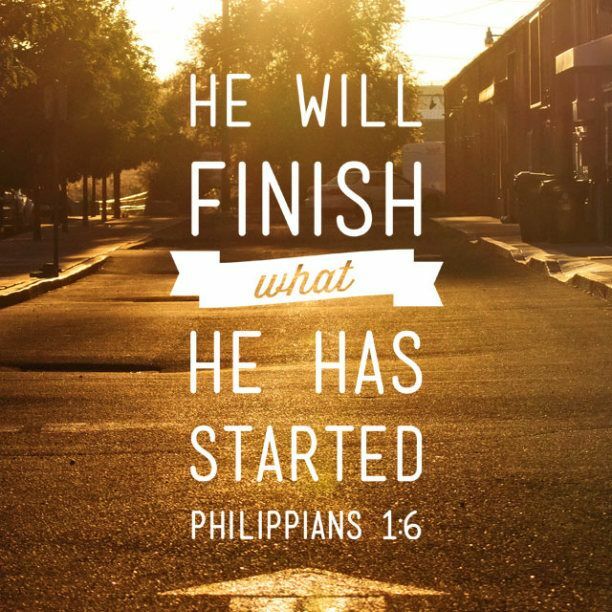 FINISH WELL, says the LORD. Don’t look for new things to do before you complete what is before you. Be faithful in the small things and the things that you know to do that I have asked of you. Use the gifts that you have right now and exercise them. As you do, they will increase and you will grow and you will be benefited as well as becoming a benefit to others, says the LORD. It is all about My kingdom and My power and MY glory. I have set My love upon you. I have given you My SPIRIT. I have poured out My blessings upon blessings upon you to be an instrument of righteousness and a vessel of honor. You are not left behind and you are not without value. I will use you for My glory and give you new and excellent assignments to do as you complete the good works that you already know about. You are My workmanship and I have beautified you, filled you, called you and empowered you to be a light in dark places, a strength to the weak, a help to the helpless and a sharp instrument in My hands to be used mightily by Me. You are valuable to Me now. Be faithful, for your labor is not vain in Me and the harvest will come for those who will plow the land, plant the seed that I give you in your hand, water it, cultivate it and wait patiently for the sure harvest of good things to come, says the LORD. For you will reap what you sow. Sow! WORK! For your work SHALL BE REWARDED, says the LORD. So be it,it is so. ELOHIM is not finished with many as of yet. No devil,no weapons, no kind of traps,or bates will stop what GOD wants accomplished threw us. GOD, if we are aware, and made aware will ensnare us. We will not die,we will live to accomplish HIS WILL for us on this earth. HALLELUJAH!!! Trying to do my best with God’s help. Thank You Lord! Thank you June, for posting this excellent word ..so very encouraging!